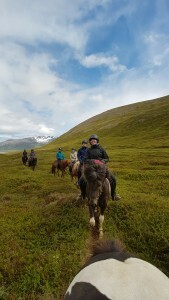 WHAT TO BRING - Langhus Lukka Horse tours and Finding your dream horse. Rain clothes (rain is very rare in our area). Some extra gloves, hats, buffs and such. So dress a little bit warmly. Regarding used riding helmets and riding shoes, don’t bring them to Iceland (because of risk of bringing diseases), or read and follow strictly the MAST disinfection guidelines. For longer rides, you might want to bring some sandwiches or other snacks that you like. We do though have some light refreshments in a break on longer tours (3 hours or more). Some extra gloves, hats, winter overalls and such (we don’t have all sizes though). A wind-tight jacket and pants. A thin hat or buff (a thick hat can be hard to fit under a helmet). If you have long underpants, or woolen/insulating underwear, it’s good to use them, and it is better to have on more layers of clothes than fewer layers.